Karan Johar’s Ae Dil Hai Mushkil hit the screens last week. The movie has been appreciated and loved by all. Before its release, the movie was surrounded by controversies and it seems that the movie is still in the headlines for all the right and wrong reasons. Before its release, ADHM got a lot of controversy due to Fawad Khan as Pakistani artistes were banned in the country due to the terror attacks. The film is yet again the limelight. ADHM has the insulting remarks about the late legendary singer Mohammed Rafi and Karan Johar has finally reacted about the same. In one scene in the film, Anushka Sharma is seen joking about Mohammed Rafi. She narrates the dialogue which sounds insulting to the legendary singer. “Mohammed Rafi gaate nahi, rote the.” Well, this dialogue from the film does not sound so good and sounds insulting. 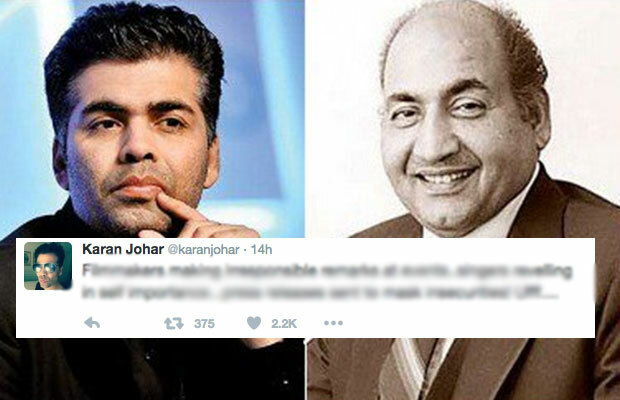 By making such remarks about a veteran singer, Rafi’s son Shahid Rafi is disappointed by KJo and wants a public apology from Karan Johar. Well, the controversies surrounded around the film gave a big boost to the film and despite many protests; the film had got a smooth release and is enjoying a great run at the box office. ADHM starred Ranbir Kapoor, Anushka Sharma, Aishwarya Rai Bachchan and Fawad Khan in the key roles.